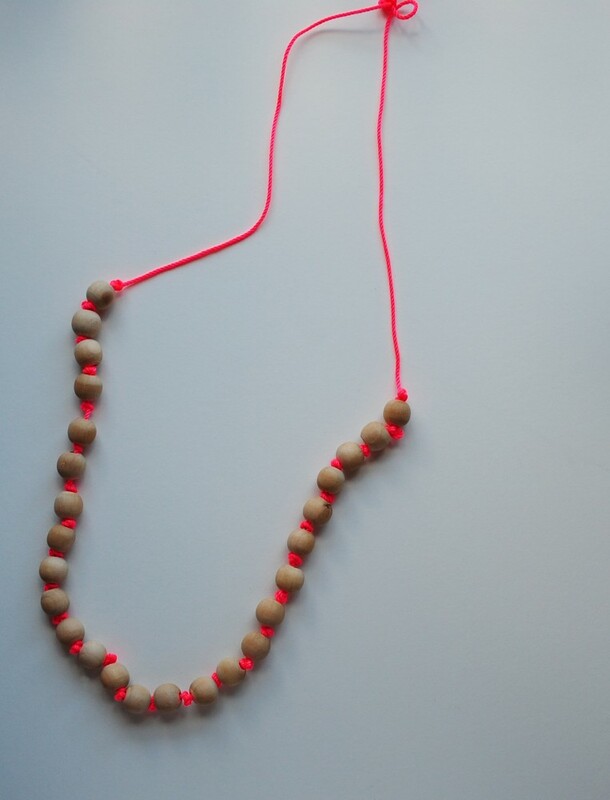 I was in the hardware store a few weeks back and saw this neon cord in a big bin — I picked up and a little light bulb when off over my head — craft project! It’s been awhile since I’ve dabbled in jewelry making, and decided to put this neon cord to good use in my closet by making myself a new necklace. 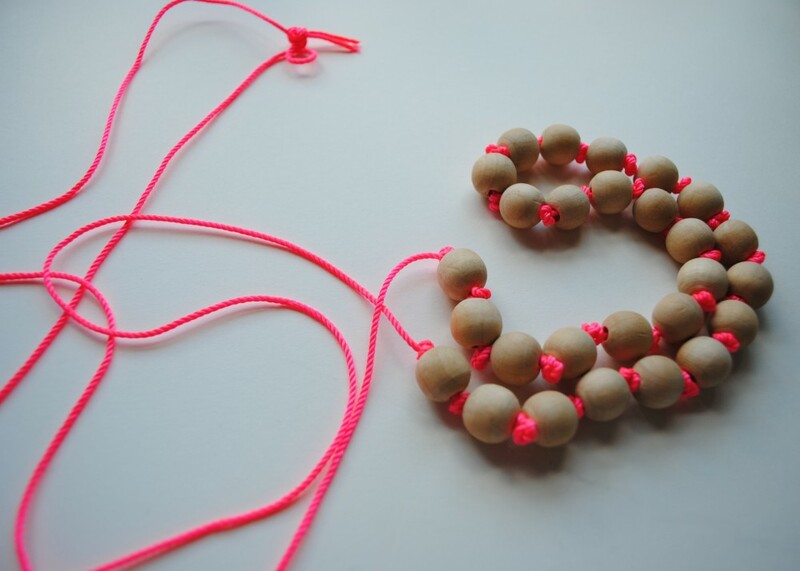 This project is as easy as tying your shoes — if you can make a simple knot, you can make this necklace! I cut a piece of the cord about twice the length I wanted my necklace to be (you lose length as you make knots). 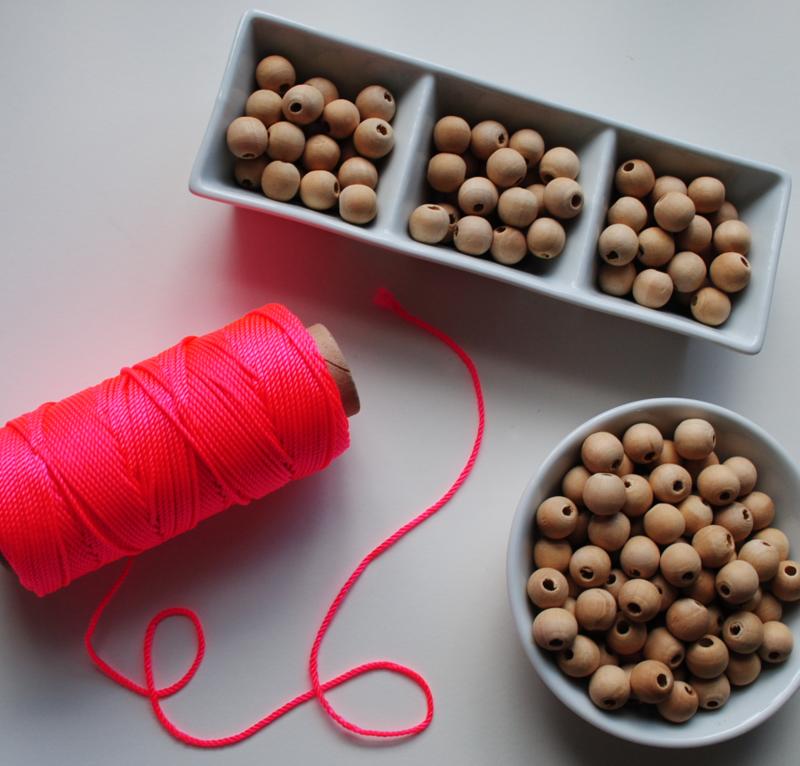 Then, starting in the middle, I added a wooden bead and tied a double knot on either end of the bead to hold it in place. Keep working on either side of the center bead, adding on additional beads and knotting just above the bead opening to hold it in place. I found that make a loose knot, and then holding my thumb on top of it while pulling tight helped keep it close to the bead. Repeat until you get to the desired length, and then grab the two ends of the cord and tie them together in a double knot to finish the necklace off! You can add a little bit of clear nail polish to the end pieces after you trim them, as well as a light coat over the top knot to keep it from fraying. Bright, cute and oh so simple, right? Life Lately. Sweet Potato Blue Cheese Frittata. 12 Responses to "Neon Necklace DIY." i was wondering when you’d post this! adorable! Cute! I’ve seen a bunch of these simple beaded necklaces, but none with the knots between the beads. Simple and effective twists like this are my favorites.